This post originally appeared on theInsiders section of Inbound Hub. To read more content like this, subscribe to Insiders. Though often mistakenly referenced as a quote by Mark Twain, White knows that adverbs can be dangerous if used overbearingly (see what I did there?). Very and similar words can bog a sentence down, and are often used where they shouldn’t be. Most experienced writers do their best to avoid them. Was that memo you just read veryimportant, or important -- either way, the message remains the same. As Stephen King has said, “the road to hell is paved with adverbs,” and most of us would be hard-pressed to disagree. Nothing is perfect, and with writing it’s no different. Things rarely work out the way you want on the first go, whether it’s writing, art, music -- anything. It takes practice, and constant checks and balances to produce a well-rounded piece, as first drafts are meant to be experimented with. If you’re sticking with the first draft, you’re effectively saying Eh, good enough, so remember to be honest with yourself. In the end, you know your audience will voice their opinions, so make it harder for them to voice the negative ones. Reading and writing go hand in hand (I’m on fire right now). They belong together, and if you don’t actively read, you’re actively limiting your vocabulary and breadth of experience. As human beings, we never stop growing or learning, so if you’re a writer who doesn’t read … well that’s like being a cook who can’t taste. Do yourself a favor and pick up a book and read to learn new diction, or better yet, a new perspective on something. You can only experience so much in your life, but reading opens you to countless settings, experiences, and points of view. Some of the greatest ideas come from accidents. I’m astonished by how many times I’ve accidentally hit gold as a result of throwing my thoughts on a blank piece of paper and free-writing to empty my mind. The trick is to spend 15-30 minutes a day just writing. It doesn’t matter who, what, when, where, or why -- as Angelou says, just write. You’ll be surprised what you can get out of yourself. Worst-case scenario? You become a better writer. This one’s pretty self-explanatory. Any writer knows that thick skin comes with the territory, but not only with your audience. When you’re collaborating with coworkers or clients on a piece of writing, it’s best to take the ‘no pride of ownership’ route. The goal, after all, is to produce the best writing possible and being able to handle a healthy dose of criticism -- or welcome it for that matter -- is imperative. Not being able to handle this has ruined many would-be writers' careers before they got a chance to show what they’re made of. Good writing can’t always be forced. It’s like trying to remember something that you can’t -- the more you try, the harder it is, and taking a break can give your mind the refresh it needs to get back on track. Like I said earlier, sometimes you accidentally happen down a path that you would never be at if you had tried to force it. Writer’s block happens to everyone, from sixth graders to best sellers, so stick with it. Sometimes there’s only one way of saying something, and when you can find the perfectway of articulating it, the impact on the reader will be that much more powerful. As any writer can attest, finding the perfect way of illustrating a picture with words can take hours -- even days or months. It may seem insignificant at the time but you only get one chance before your work is published, so make sure it’s the way you want it then, not later. This one hits home, doesn’t it? It’s also pretty self-explanatory. Over-explaining is exhausting for everyone, so if you’re able to narrow your difficult thoughts or sentences into a concise one-liner, why take time to fluff it up? Cut the fluff. George R.R. Martin wrote this on his blog, letting his readers know he’s not one of those writers who has to tell everyone what he’s been writing, and how much he completes each day. It doesn’t matter how you get to the end, all that matters is who’s reading it and if they’re enjoying it. This is important, because too many writers today worry about the process, but sometimes, there isn’t a strict process to adhere to. The more you write, the more you’ll find you have to say. It doesn’t matter how many times you’ve changed a line, or word -- the only one your audience will remember is the one you chose to use last. Writers need to be everyone. That’s the task they embody -- the best writers know how to get inside the heads of their audience, and the voice they’re trying to portray. They’re able to cut away from the norm or common denominator to give their topic a well-rounded appeal. F. Scott Fitzgerald was able to do just that by getting in the head of Gatsby narrator Nick Caraway, without which, the novel would never work. Goes to show you that the little things matter, and connecting to your audience is paramount. Writing is tricky. On the one hand, like Gaiman says, there are no rules. You can write anyway you want to. On the other hand, there are a lot of rules, so it generally helps to play it straight down the middle. The key word here is honestly. Writing honestly is one of the most powerful ways of affecting your audience, instilling trust in your words and more importantly, your ideas. All writers run into difficult comments or criticisms, but if you can look in the mirror after it all and be proud that you tackled the subject in an honest, confident way, you’ve done your job. This is one of the shortest, most powerful quotes there is on writing from the late, great, William Faulkner. Too often, writers focus on the person behind the story, but great writing doesn’t translate into how many published works you’ve created. As a writer, you need to be writing constantly in order to hone your craft. The simpler explanation: If you aren’t writing, you’re not a writer. It’s not about your title, but your actions. This post originally appeared on the Academy blog. To read more content like this, subscribe to Academy. In this post, we're going to cover some of the most important metrics you should track on a weekly basis to help keep you more agile. Remember, if you keep a close eye on these metrics, it'll help you pivot and adjust your marketing campaigns more quickly, helping to get closer to those looming monthly goals. After that, we'll go over how to improve them, as well as how to prepare for the following week. Tracking the number of views you get per blog post is great way to get quick feedback on your blog articles. You're more likely to get a higher view count if you picked a topic your audience liked and wanted to share. 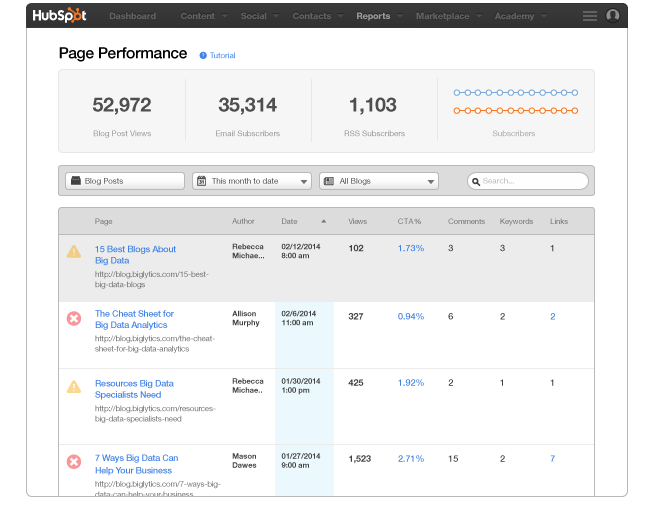 If you're a HubSpot customer, you can get this information in Page Performance. To see post-level view counts as well as total view count, sort the columns within the tool by number of views, and pick a time frame like one month. Now you can see how your recent posts have performed against each other. Want an extra tip? You can also compare your recent posts' view counts to your overall average by exporting that data and running an average of all your posts in Excel. Measure blog post views to figure out which blog content is performing the best. Knowing what content naturally got the most views can help you decide what topics and types of posts to write next. You should use this information to plan out your next few weeks of content so you're writing the posts that will drive the most views, and help you hit your monthly goals. And by looking at this information week over week, you can make adjustments to your content schedule to improve your results. After someone reads your content, you want that person to take the next step and click on your call-to-action (CTA). The metric you should most closely measure for CTAs, then, is your click-through rate, or the percentage of folks who clicked on the CTA. If you're using HubSpot’s CTA tool, you can track the performance of different CTAs and see which ones are performing best. You could even take it a step further and show a Smart CTA based on a reader's lifecycle stage or membership to a list. First, take a look at what CTAs are performing the best today. Then, decide if there are higher conversion rates on certain types of CTAs, as well as what might cause that better performance. Is it the design of the CTA? The content positioning? Is the content that the CTA is promoting more appealing than your other content? For example, if you have high conversion rates on CTAs that lead to a worksheet and lower conversion rates on CTAs that lead to a whitepaper, that may mean your audience prefers worksheets over whitepapers. Embrace agile experimentation to figure out why certain CTAs perform better than others. Tracking the performance of your social media is important to understanding its ROI. A social media goal that many companies have is increasing the size of their social network, or their total number of fans and followers. Why is a large social reach valuable? So when you publish your content, you can reach a larger number of people who might read and share it. So ... do you see a bump in your social analytics? What did you do differently last week that might have helped you grow your network? If you see an increase in your progress from a particular week, think about what specifically you did to attract more followers or fans around that time. Was there a marketing campaign going on? Did you newsjack something insanely popular? What type of content did you publish on these channels? 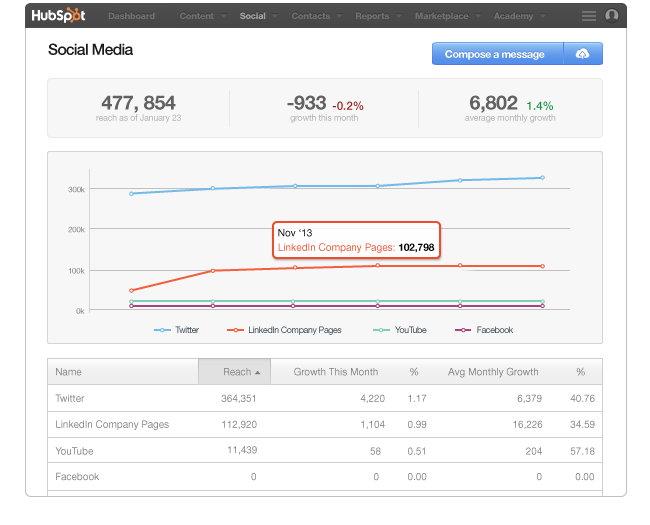 It's important to check these stats on a weekly basis so the strategy and the content you posted is fresh in your mind. After you decipher what caused your bump, use it to inform next week's media plan. When you're looking at your email marketing metrics, the most important metric is not how many people opened your email. I would argue it's how many people clicked through to reach the content that the email was promoting. That could be the number of people who clicked a link in your email, or clicked on the CTA in that email. This metric is known as your email clickthrough rate, and you should be able to get it right in your email tool. By measuring your email marketing, you'll get a sense of what your audience wants to read by email. (Sometimes your content may perform well on email and not other channels, so it's worth experimenting.) Take a look at the performance of different emails and look closely at the ones that performed the best. Did you promote a particular piece of content? Did you use a certain tone? How clear were your calls-to-action? Based on what you discover, create similar emails that embody some of the tactics that made your emails successful in the past. Bonus: You can A/B test your emails to help improve clickthrough rate, too. The CTR of each email variation will help you determine what email elements are most successful. Arguably the most important metric for marketers to keep their eyes on is lead conversion, or the percentage of visitors who convert into contacts by filling out a form on a landing page. The conversion rates of your landing pages will then determine how many leads you're able to generate. 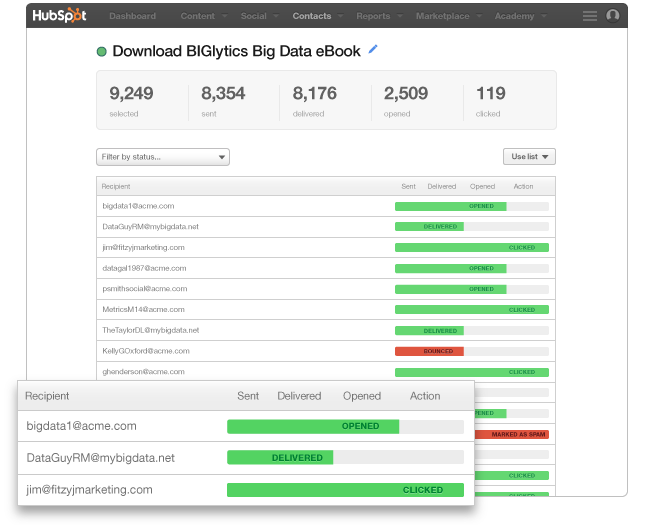 If you're using HubSpot’s reporting tools, it's easy to measure the success of individual landing pages. Whatever tool you use, though, be sure you measure how many people are visiting your landing pages, the conversion rate of those pages, and whether the leads generated from those landing pages become customers. These metrics will help you determine which content offers and landing pages to use when marketing through other channels. 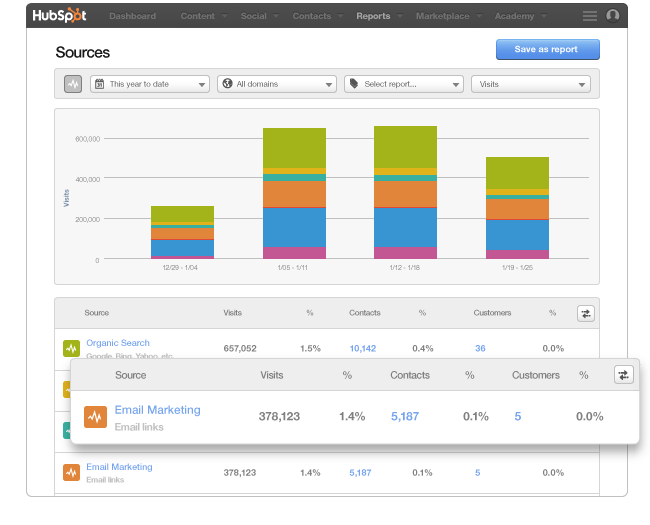 Take a look at your landing page dashboard. Which pages have the highest conversion rates? Which pages have the most views? Look closely at your high-performing landing pages to see what made them successful. Was it the content piece on the page? Is the form optimized for your audience? Did you personalize the content on the page? Did you send the landing page to a particular segment? Identify what attributes made one landing page more successful than others, and then replicate it for future conversion wins. You need to figure out who's coming to your website, and how they found you. If you do anything, make a habit to check this report once week -- at least! Social Media: Visits from social media sites including Facebook, Twitter, LinkedIn, etc. You should also look at the number of visits, leads, and customers as a result of those channels, as well as each of their conversion rates. You should always focus on growing your strongest marketing channels and making them work even better for you. In the example above, organic traffic is the biggest driver of traffic to the site, but social media has the highest conversion rate. By digging into the specifics and adjusting the date range, you can really understand how the different channels perform to help you hit different metrics. So figure out what channel is performing the best, and think about what you did that past week to contribute to its success. (Seeing a theme in this article?) If you only used certain channels in a week, highlight just those channels. For your next week, plan on replicating your success by either focusing on those channels that performed well, or creating similar content that led to the traffic bump. Even though you should be looking at certain metrics on a weekly basis, you should always keep your eye on the prize: your end of month goals. The adjustments you make throughout the month by looking at your data on a weekly basis can really contribute to whether or not you reach your monthly goals. 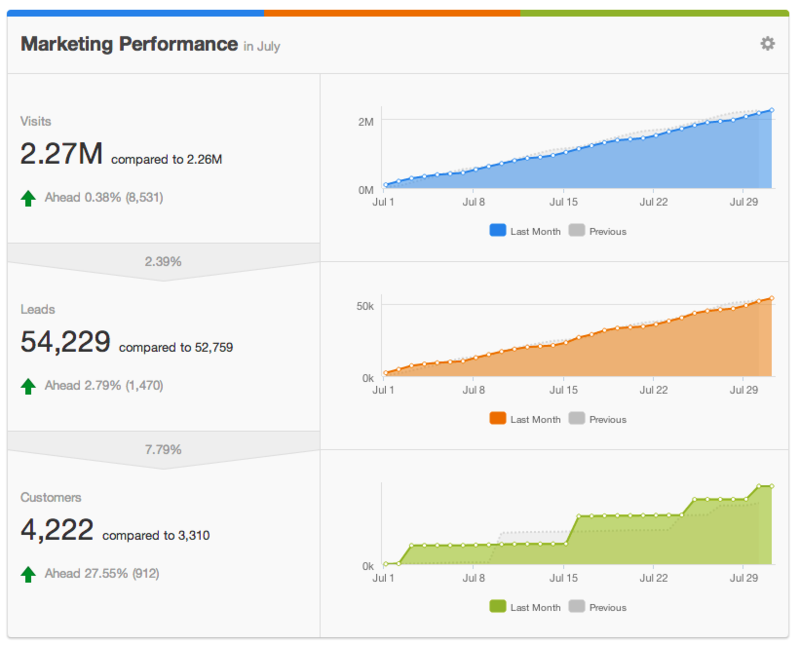 A great place for HubSpot customers to track monthly progress is on your Dashboard. If you aren't a customer, you can set one up using Excel. Using the Dashboard, you're able to set goals month over month and watch your progress each week. You're even able to see how your current monthly progress versus the previous month. There isn't one single way to improve these metrics besides tracking and iterating on some of the metrics we covered earlier in this post. Drill into the data to discover how you're performing against your goals and what you can do to improve going forward. As you can imagine, keeping yourself up-to-date on a weekly basis will help you stay on track. At the end of the day, your metrics help you be a more informed and nimble marketer. Make a commitment to always be tuned into your metrics, and your marketing will thank you for it. What other metrics do you check on a weekly basis? Which metric could you never live without? Let us know in the comments! Do you care more for your audience than SEO? Your in luck. Google finally caught up to you. "With Google’s Hummingbird release, Google wants to help your customers find the most helpful, interesting content that is not only relevant to their searches, but matches their intent during the search. I like to follow the ideas of Rand Fishkin and his think tank at Moz for guidance on this subject. I can’t say it any better than Rand, so here’s a great Whiteboard Friday:"
Thanks to John McTigue, Published March 10, 2014, Read more. If you liked this post you would like, "How to Create Emotional Industrial Marketing Ideas". Maintaining a social media presence is all too critical these days. How many followers, likes, and connections someone has seems to be part of our daily language and we have seen individuals, brands, and businesses benefit heavily from it. One of the many great things that social media offers is access to instant information. This has been great for many consumers; people and businesses alike. I personally have used social media to ask questions about a product and received very timely and professional responses. It is access to customer service and information like this which makes social media platforms such a valuable tool in the business realm. One of the more popular platforms, LinkedIn, is a great example. It is the platform best known for its professional foundation and has become one of the most trusted and credible social communities on the web. LinkedIn provides users with the ability to connect to other professionals and to join professional groups to engage in meaningful discussions. Creating a group on LinkedIn for any business would be advantageous, but in order to get the full reward you must nurture your group, which takes time. We have found a few guidelines for creating and maintaining a successful LinkedIn group to help you aquire the full return on your time spent. A good way to get started is by having a narrow niche. This helps you attract the right kind of individuals to your group. As a group creator you should focus on driving current clients/consumers to your group so they can utilize it as a forum for asking questions and gathering information; however, you also want to drive potential clients/consumers to your group too. Establishing yourself as a leading contributor to your industry through your group (by answering questions, posting industry relevant material), you build credibility, which helps drive potential clients/customers your way. This is why a specialty category is important; recognizing that not everyone using LinkedIn is going to use your service/product is a great way to begin thinking about investing quality time into those who will. Participation and engagement are imperative to making a successful LinkedIn group, you must pull your weight. When people post articles or information regarding your niche, comment or ‘like’ the post. This shows individuals in your group that engagement with individuals is important; again, helping establish credibility. When someone new joins the group, greet them. LinkedIn has an option to send a specialized message after someone joins, use it. It is also well known that people use LinkedIn to promote themselves and their qualities. Granted, people didn’t join your group to be inundated with spam and job postings, but helping people in your niche find jobs is always a plus. According to Jessica Faye Carter owner of Nette Media, creating a subgroup that allows individuals and companies to post job opportunities and resumes is a great way to mediate the situation and everyone is happy; people can look for jobs and those not looking do not have to be flooded with those posts. It is also important to monitor what is posted in your community. A well moderated group typically outlasts those that aren’t. If an individual is contributing too much self-promoting posts, tell them. Do not be afraid to set strict guidelines for posting; LinkedIn also has group settings that allow for all posts to be approved, yet another great feature of this platform. Also, good moderating of your group typically means no 'auto-posting' by you. While, auto-posting seems to be a growing area, Susan Tatum, from the Conversion Company, explains that it isn't always beneficial. Different social media platforms are approached differently and auto-posting often doesn't take that into account; this can harm group engagement and even hinder sucess of the group. We see the blue LinkedIn icon everywhere. Websites, trade shows, commercials, etc. But it isn't often we see specific companies/people promoting their specific LinkedIn group. This is a great way to get people to check out your group, especially if you are promoting to the same audience you want to join your group, like at a trade show event. Taking your LinkedIn icon to the next level and incorporating your group can really help generate group members. Another important rule to follow regarding your group, DON’T push sales. Individuals who join your group are doing so because of the information that you provide through answering questions, engaging, and sharing interesting industry news, not because they want to buy more of what you have to offer. If they want to purchase from you, they will do so via a phone call or email, not through your group. Many groups do not recognize this down fall. Yes, sharing a blog post you or your company has written is ok, after all, that is information you are giving away, but to try to sell group members something will get you absolutely nowhere and no sales and group membership will drop off quickly. Remember, this platform is used as a tool for nurturing relationships with people, actual humans, they aren’t credit card machines looking for a purchase. This will also devalue your credibility, which is exactly what you do not want. Remember to use this as a way to build relationships with other people, not get into their wallets. With these tips success will follow. Moderating a group is no easy task and one that takes due diligence and time, building a relationship never is. But when done properly, the benefits outweigh the costs every time. In what might be the greatest insult to industrial directories, Google is now going after the likes of ThomasNet and GlobalSpec, Grainger and eBay for the marketing and selling of industrial products. ThomasNet is well 100 years old and the granddaddy of industrial directories. Initially, ThomasNet didn't play well with Google and its pages weren't indexed. Now they have partnered with Google and are showing up too much on the first page. Is that the reason Google appears to be out to eat their lunch? ThomasNet has never been a price-based industrial directory but that's exactly what Google wants, and eBay fears the same. GlobalSpec started out thinking manufacturing engineers wanted a single location where they could buy every nut, bolt and bracket for their wigit. But they could never please the vast differences regarding how things are made and purchased in the world. Google Shopping debuted Jan. 21, 2013. It started with electronic components and then added test/measurement components -- mechanical componets recently followed, which include bearings, actuators and pumps. Currently in Beta, all fees are waived for the first year. Two options later: pay or opt out. We'll sign up our clients for the first year free and see how it goes. After a year Google will show results. Currently Google is driving traffic to this industrial platform, which filters out consumer results. In the future this advertising platform will be similar to Adwords, look out Thomas Register Industrial Directory (ThomasNet). They may go to a Google Supplier Badge-type of verification. They will charge for that verification process. After that, pay per lead or click. Google partnered with Dun & Bradstreet to actually make a call and confirm that companies are legal in the US, etc. It's primarily focused on US, Germany and China now. Will open up later to global. Many top spot accounts are using this platform. Currently not triggering on mobile yet, but will. You can type in the actual URL for now. They did this because they thought they were underserving the b2b. Fluke and Maxim semi-conductor are on board. They say this is especially good for first time, smaller businesses that are just getting started. This will be similar to TR product search, where you can input a part number and get relevant results. Will be building out filter for ISO, and other certifications like RoHAS. Sounds great but our clients don't sell on price. Just about everything in B2B Google Shopping has a price. Our clients products require at least a small amount of questions by the sales team. Do they need a bracket? Did you forget to tell us one of the required specifications. And shipping isn't something you can quote quickly for large bulky items. For example, you can buy a cheap home safe online with $50 shipping but what they don't tell you is that it's your responsibility to get it off of the truck and into your home. Now we all are going to have to get used to automating our sales process enough so it can be done online. Zappos, the online shoe company, founded in 2009, is now $1.2 billion in sales. If they can successfully sell women shoes (including pumps) online confidently, then we can figure out how to make manufacturing engineers happy that we asked the right questions so they get their motors or pumps delivered -- right to their plant with everything they need to install it. Even if that means partnering with local mechanical service companies. It all comes down to the industrial marketing media schedule, how do you decide where to invest your marketing dollars? You must get your web site at least potty trained, and you must create a simple, elegant affordable adwords program, but that where it gets hard to justify. When you're sad because your company decided not to attend a trade show, what's wrong? Sure business is a big party but it's a sporting event as well. Only a very few like MODERN MACHINE SHOP and POWDER BULK ENGINEERING have managed to survive. And that's because of great editorial. These are the trusted voice of the industry and it's an honor and a privilege to get published there. In the end our job is to provide the sales force with new and interesting companies to learn about and go visit on their regular sales treks. It's a lot easier said than done. We spent last night combing SalesGenie for leads and today using Google Earth to fly over industrial parks, inspecting what's on the trailers going to and from factories.